This review by Stan Rockwell is quite complete, and I thank him for that. I can add to this analysis that I do not reduce human beings to small structures of the brain. On the contrary I show that some people with damaged brains can function in a way that science cannot explain. We are the expression of a master model which the physicist David Bohm called the implicate order. By studying this model we may garner answers which science cannot provide and won’t be able to provide. This, because science’s accepted paradigm is limited to time and space while David Bohm’s master model is situated outside of time and space. I applied his paradigm to the Taoist model. Indeed, I presumed that if nature is an expression of the implicate order as Bohm implies, then our brain is an expression of this model. Not only that but our psyche is also an expression of it. Thus somehow we must express it through our mythologies and legends. Some people more in tune with it might have systematized it intuitively. This is what I found in the Taoist model. Brain research results provided the proof that this ancient intuitive system, interpreted by occidental medical doctors holds the key to what, how, WHO and WHY we are. That is the conclusion of Ariane Page, a self-described hygienist-naturopath and former assistant director for the CBC in Montreal. The narrative journey toward her book’s conclusion is more than 600 page long and covers Egyptian mythology, Christianity, Judaism, Islam, Essenism, Zoroastrianism, Traditional Chinese Medicine, Dante, the Nibelungen, Carl Jung, Don Quioxte and many other stories as well as a lot of neuroscience, all interwoven together in a philosophy called the LIFE biosystem approach. This is a theory of everything. 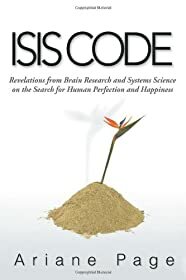 And although it is an undertaking to read, Page’s Isis Code: Revelations from Brain Research and System Science on the Search for Human Perfection and Happiness is a thought-provoking book. Page writes at the beginning that she does not wish to write an exhaustive text. She even invites readers to skip over the neuroscience parts. But it was next to impossible to jump over the neuroscience, for it is deeply embedded in the book. This made for some arduous reading. I had to take notes and re-read certain sections in order to comprehend. The author also states that she did not set out to write a linear book, as such an approach “does not touch the heart, it only dries it up more.” Indeed, the book is far from linear. It moves from a discussion of science juxtaposed with myth to memoir from Page’s life. For the most part, it moves smoothly, but at times the transitions can be jarring. Toward the end of her manifesto, Page proposes and lays out a new form of government that would find a balance between the masculine and feminine polarities. The problem she sees with current cultures is the over emphasis on the masculine, almost to the exclusion of the feminine. There are paradoxes in her storytelling, though. At one point she writes that “much of modern science, and thus the way we perceive the world, is a direct product of the reductionism of Grecian origin and the Christian dogma.” However, Page herself reduces behavior down to very small specific areas of the brain. I know that she’s building evidence for her case, and in a masculine-based reductionist world that may be a perceived necessity. But how could one get more reductionist than that? More specifically, Page examines specific brain parts and their functions and interactions in behavior, both individually and culturally. She also hypothesizes a developmental model for humans and how we utilize different “brains” — what she labels reptilian, mammalian, analytical, human, and universal. An example of her prose, which refers to these different types of thinking we employ at different times, as well as to Chinese medicine: “The kidney aspect of the physiological system (Reptilian brain) expresses difficulties of the system through its reactions of fear. The liver aspect, the Mammalian brain, manifests anger, aggression, and associated emotions. The lower heart (Human brain) expresses difficulties through agitation …” and so on. At one point she discusses psychopathy through this lens, and determines that it is a reptilian brain, functioning from the masculine polarity, without mitigation from the feminine pole. She includes diagrams to help explain her writing, but they are tucked in the back of the book, nowhere near the passages they’re meant to illuminate. I found it cumbersome to flip back and forth through the 620-page tome. On the other hand, Page also provides hands-on exercises to go with some of her cerebral theories. These include a very good and practical guide to abdominal breathing for stress management and meditation. The final chapter looks at problems with GMO crops and with a culture dominated by money-driven, masculine-polarity corporations. The book is certainly a manifesto, as well as a modern model of, well, everything. Luckily, despite that it is at times hard to follow, Page’s jumble of theories and mythologies and science gender makes for a very interesting read.